If you have the fear of public speaking, you are not alone. You must first recognize what “fear” is. Fear is the anticipation of pain. Is your fear real or imagined? Here are some great insights into Overcoming Fear of Public Speaking. 1. Fears: The fear of being judged, making a mistake, not measuring up, getting hurt either mentally or physically can get in the way of a good performance (speech, seminar, sales presentation, etc). Remember that people in the audience really want you to succeed. Nobody is standing there hoping you’ll be boring or bad. If you are coming from an authentic place, and you cover the material with clarity, you’ve won 3/4 of your inner battle with fear. 2. Learn how to enroll your audience: If you haven’t yet taken a professional development course on public speaking, consider finding a public speaking training course appropriate for your needs. Learning the art of public speaking can enhance your results in a boardroom, in a sales presentation, and even accelerate your climb up the corporate ladder. It is a must-skill for any executive and/or business owner. 3. Practice: Business organizations, networks and clubs in your area (such as Toastmasters) that can afford you the opportunity to practice. Remember to choose topics that you are already an expert on. Speaking on a topic that you are not familiar with will increase your stress, and impede on your performance. 4. Use recording software: Record everything on your PC/laptop. Review it to see where you can improve. Have speaking pros attend your live presentation to give you feedback. Allow yourself the opportunity to learn more every time you go out. 5. Remember: Even the top professionals learn something new every single time they go out! Do you want to be a parent? If so, how are you going to be a good parent? Spend some time brainstorming (explore brainstorming here) these, and then select one goal in each category that best reflects what you want to do. Then consider trimming again so that you have a small number of really significant goals on which you can focus. Then create a daily to-do list (investigate to-do lists here) of things that you should do today to work towards your lifetime goals. At an early stage these goals may be to read books and gather information on the achievement of your goals. This will help you to improve the quality and realism of your goal setting. Set performance goals, not outcome goals: You should take care to set goals over which you have as much control as possible. There is nothing more dispiriting than failing to achieve a personal goal for reasons beyond your control. In business, these could be bad business environments or unexpected effects of government policy. In sport, for example, these reasons could include poor judging, bad weather, injury, or just plain bad luck. If you base your goals on personal performance, then you can keep control over the achievement of your goals and draw satisfaction from them. 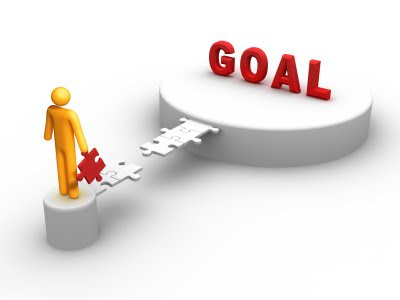 Gain a deeper understanding of SMART goal setting in our in our next article entitled 'Locke's Goal Setting Theory'. When you have achieved a goal, take the time to enjoy the satisfaction of having done so. Absorb the implications of the goal achievement, and observe the progress you have made towards other goals. If the goal was a significant one, reward yourself appropriately. All of this helps you build the self-confidence (build self-confidence here) you deserve! If you achieved the goal too easily, make your next goals harder. If the goal took a dispiriting length of time to achieve, make the next goals a little easier. Deciding what is important for you to achieve in your life. Separating what is important from what is irrelevant, or a distraction.